Formerly Lao Youth Inn 2, this budget accommodation has been given a new name, brand new lobby and higher rates that include an extra 10,000 kip charge for a room with a window. The freshly painted green and white lobby/front patio now doubles as a small cafe with a sporty theme. But the rooms are still much the same as before. They are big, clean and barebones with a few bits of old furniture and a tiny wet room bathroom. 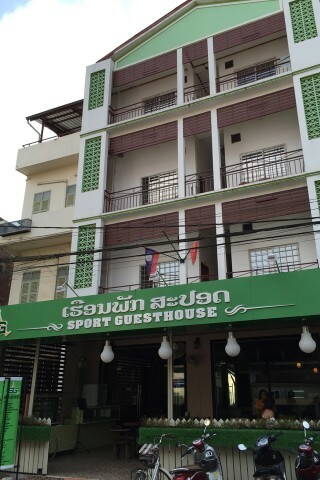 Sport Guesthouse is the best choice for budget conscious backpackers in need of air-con and a private bathroom, and it offers a very good deal for a triple. As the price indicates, the quality is a step below its neighbour Mixay Paradise. Breakfast is not included but there is WiFi. The bicycles for rent are rubbish, you can find much better ones elsewhere.